In this context, Chicago refers to The Chicago Manual of Style developed by the University of Chicago Press. This is the style on which most theology publishers base their style. This is the preferred writing style of Lancaster Theological Seminary. This style is characterized by the use of footnotes or endnotes to provide short references within written work, with a complete bibliography at the end of the work. The Chicago Manual of Style released it's 17th Edition in 2017, and the 9th Edition of Turabian's A Manual for Writers of Research Papers, Theses, and Dissertations was published in 2018. These are the editions we encourage you to refer to. In most cases, the 16th and 8th editions (respectively) will also suffice. Watch the webinar recording of "Citation Styles," a Hacks for Seminary and Beyond workshop that took place on October 26, 2016. 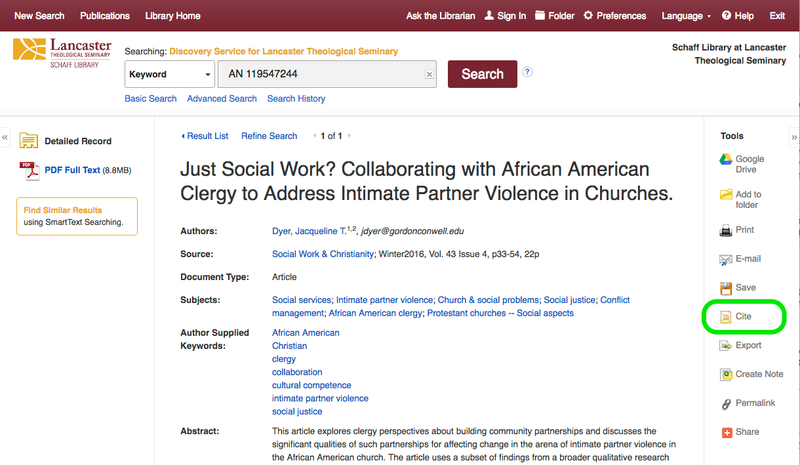 Tip: Use the Google login option and your lancasterseminary.edu account to join the discussion. Need a coach for your project? Acknowledging your sources is a crucial part of creating your own work, whether you are writing a paper for class or preaching a sermon in a church. Whenever you use someone else’s words, are inspired by someone else’s ideas, or mention someone else’s work, it is important to note that in your own work. This is called citing your sources. When you do not cite your sources at all, or cite your sources incorrectly, it is called plagiarism. Plagiarism is a violation of academic integrity that could result in admonishment, suspension, or dismissal from the seminary. In a professional setting, plagiarism is an act of fraud and is legally actionable as such. To learn more about plagiarism, what it is and how to prevent it, please visit Plagiarism.org. Effective time management and planning are the best strategies for preventing plagiarism. You are more likely to cite your sources completely and correctly if you are not rushing to complete your assignment at the last minute. Paraphrasing is an important writing skill when you put someone else's words and thoughts into your own words. Visit the Purdue OWL site to brush up on your paraphrasing skills. If you are in any doubt about whether something should be cited, DO CITE! Your instructors would much rather see unnecessary citations than missing or incomplete citations. Double check your citations with similar examples from the Purdue OWL site or the Chicago-Style Quick Guide. Even if you have used a citation builder or citation generator provided by the source, DO double-check because even these tools can make mistakes. If a similar example is not available, ask a friend to try finding your source using the information in your citation. If someone can't find the source you've used, then your citation is incomplete. Giving credit to your sources is just as important in oral works as it is in written works. Whenever you preach a sermon, give a speech, or present at a workshop, you must orally give credit to the works that inform your work. For workshops or other educational settings, provide your audience with a printed bibliography or a link to a bibliography that is posted online. Click here to download a 3-page PDF with examples for how to cite common sources. The 17th edition of The Chicago Manual of Style was published in Fall 2017, and the 9th edition of Turabian's A Manual for Writers of Research Papers, Theses, and Dissertations was published in Spring 2018. Many online resources that we direct you to have already been updated to these new editions. During the 2018-19 academic year we will be transitioning to the latest editions and editing our customized resources. While we are transitioning, feel free to use the previous edition if you are more familiar with it. 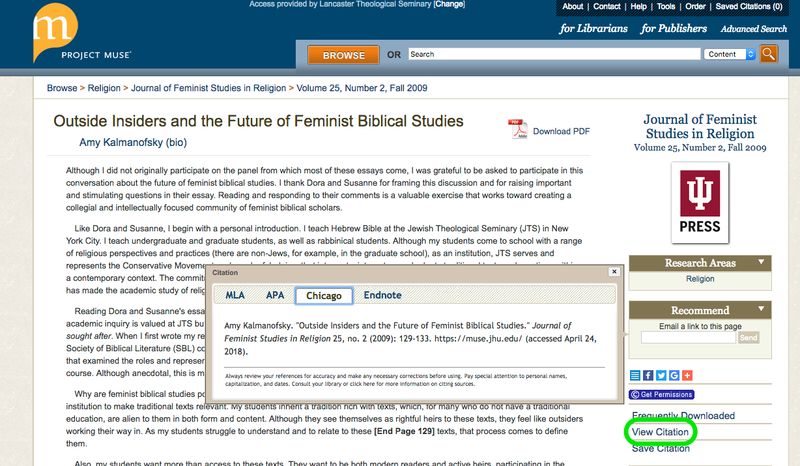 Chicago/Turabian notes-bibliography style uses footnotes in the text as a way to cite your sources when you use them. A footnote needs to be used following both direct quotes and paraphrases. Insert the footnote at the end of the sentence, after your closing punctuation, using your word processor. This will put a superscript number at the end of your sentence and move your cursor to the bottom of the page where a matching number appears. Type in or copy/paste your citation here, then return to the main body of your paper to continue writing. When you have completed your assignment, you will collect all your sources into a bibliography. This starts on a separate page at the end of the document. The listings are in alphabetical order by the author's last name. Bibliography entries are also formatted to use hanging indents. The formats for footnotes and bibliography entries varies slightly. A footnote is formatted to read like a sentence and uses commas and a period at the end. A bibliography entry is formatted to read like a paragraph and uses periods throughout. Who wrote it - Be clear who actually wrote the words you are citing. This is particularly important when you are citing a work in an anthology, editor's notes on a work in an anthology, Bible verses, and annotations found in a particular edition of the Bible. Who published it - Identifying publishers, and in some cases editors, is just as important as identifying the author of a work. Publishers of webpages can be tricky and may require going to an "About" page elsewhere on the website to get enough information. If a publisher is not available, use N.p. (meaning no publisher). What is it - The type of source is a major factor in the format of the citation. Websites are formatted differently from books. When was it published - A publication date is important in citing a source correctly. Multiple editions of a source may exist, or an author may have published an article and book with the same title but in different years. Dates on websites are important to find, too. If a date is not available, use n.d. (meaning no date) in your citation. When accessing online content, note the date you accessed it because this will be part of your citation. Where is it - Where a source is located and how it is accessed is also a factor in the format of the citation. Chicago style requires URLs to be included in both notes and bibliography. You may also want to include the name of a database where you accessed a full-text resource. Today's word processors are incredibly powerful and contain preset formats for both footnotes and hanging indents for your bibliography. Whether you are using Microsoft Word or a cloud-based word processor like Google Docs, you will be able to insert footnotes and format your bibliography with ease. Feel free to schedule an appointment with me to discuss your research needs. Click the button above to sign up for an available time. A citation generator is a piece of software or an online application that creates a citation for you based on metadata from a source (i.e., book, article, website, etc.). Metadata is information about a source, like the title, author, and date of publication. Some citation generators require you to enter the metadata for your source. Other citation generators gather metadata from a record about the source or from the source directly. In almost every case, a citation created with a citation generator will need to be edited to correctly match Chicago/Turabian style. Billed as "your personal research assistant," Zotero is a powerful tool that helps you collect and manage all the resources you consult for seminary assignments, sermon preparation, and research for your church and community. It is an application that you install on your computer with companion plugins for your browser and your word processor. Best of all, it is FREE. For more information about Zotero, please see our Zotero guide. EBSCO includes a citation builder within all the databases they provide. 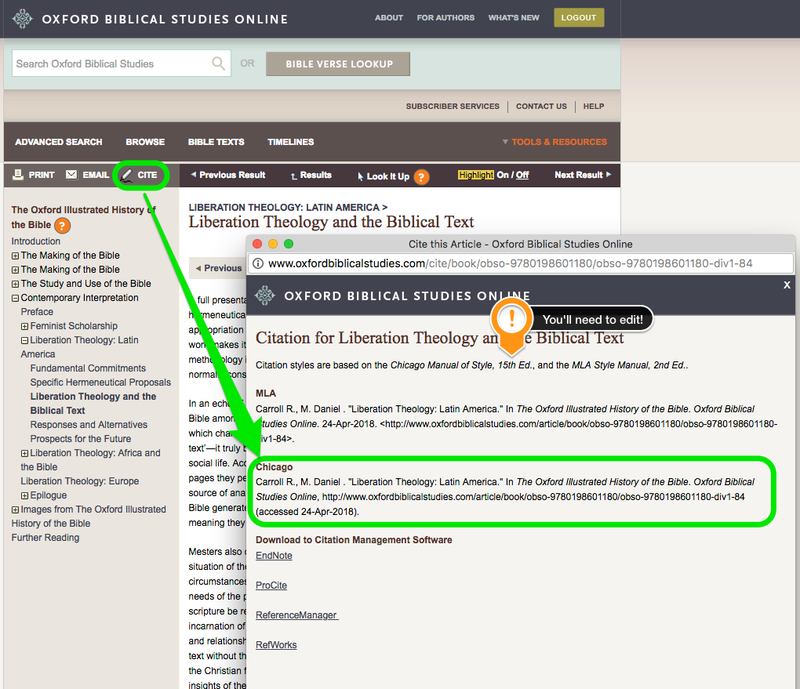 Click the gold square to the right of the full-text article viewer or from the record detail screen, then scroll down to "Chicago/Turabian: Humanities" in the yellow window that appears above the record. Copy and paste this into your Bibliography. OBSO also has a citation builder. From any article, click the "Cite" link in the toolbar. This will open a popup window with a pre-formatted citation. Notice that the citation is based on the 15th edition of The Chicago Manual of Style and will likely need a bit of editing to be consistent with the most recent edition. Also, the citation is in bibliography format. Copy and paste this into your bibliography. For a footnote, adjust the style accordingly. The citation builder in Project MUSE is available on the right side of the detailed record view. Click "View Citation," and a new frame will appear on top of the record. Click the "Chicago" tab to see the citation in Chicago format. The bibliography format is provided; copy and paste the citation into your bibliography. Make the appropriate adjustments when using the citation in a footnote.